Maddy and Rogan were cousins. But the magic between them was not very cousinly and was looked down upon by both their families. These are the very families that pushed them together in the first place because they were the exact same age. Maddy feels like they are one in the same, until they both get cast in the school production of Twelfth Night. On stage Maddy begins to see the big separation between them. Rogan completely owns the stage especially when he sings. Maddy is simply a character actress, she is good at what she does, but is missing that special something that was once a prominent talent in the family. Slowly Maddy and Rogan change and grow up and apart from one another, though first love is something one can not forget. This was a beautifully written novel about the magic and excitement of first love. It is also about the things that can keep us apart. I love the magical world that Elizabeth Hand wove around the characters with her words. The whole story read like you were in a love-induced fog. Heartbreaking and lovely moments one after another, though wholly realistic, were whimsical passages into another cosmos. The relationship between Maddy and Rogan was frowned upon and there are some who will frown upon it now. First cousins being romantically involved can be a bit hard to understand. Though when you take into consideration that they were always together, and their families could be a bit aloof or spiteful it makes perfect sense. I could almost hear the crackle in the air from between their two bodies as they lay together and share the magic they found. This was so well-written and had I read it last month I would have included it in my "Short and Sweet: some of my favorite books under 200 pages" post. This book was a perfect portion of magic and love and life. "Rogan and I were cousins; our fathers were identical twins." "And no audience, save for Rogan and me." This sounds like a really beautiful books full of feelings, thanks for reviewing it. 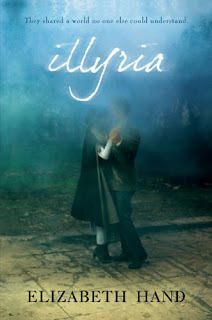 The cover looks like they are in a magical fog with their faces obscured. I've never known what this book was about I'm glad you reviewed it. I think I could forget they were first cousins enough to enjoy the story. Good Review. Glad you were honest about the cousins thing.